Airbags are built to save lives, and they do. The National Highway Traffic Safety Administration (NHTSA) estimates that airbags saved 13,967 lives between 1987 and 2003. Since 1998, all new cars have been required to have front air bags; side airbags are now also increasingly common. These devices can reduce the risk of accident fatality by 11-13%. However, airbags can also cause injury. As crashes happen very quickly, airbags deploy at around 200 mph. For those who are positioned incorrectly, as well as for children 12 and younger, this can pose a serious hazard. Each year sees a number of airbag-related injuries and fatalities, particularly among children. In order for airbags to do their job effectively, you, as the driver, have to do yours by making sure that everyone in the car is seated appropriately. Even in cars without airbags, children 12 and under are safest in the back seat. Always try to plan ahead so that you won’t have to transport children in the front seat. Because children are smaller and more fragile than adults, airbags do not impact them appropriately. As a result, children sitting in the front seat can suffer serious injury from airbags if involved in a crash. Infants under one year should be seated in rear-facing seats, as their head and neck muscles aren’t yet strong enough to resist the force of a crash. These seats must ALWAYS be placed in the back seat. Children older than one year can be placed in forward-facing convertible safety seats, which should also be placed in the back seat. Booster seats should then be used until seat belts fit the child appropriately. If there is a compelling reasons for a child to be seated in the front seat, such as a medical condition that requires constant supervision, then the child should be properly restrained and the seat pushed back as far as possible. Installing an on/off switch for the airbag may also be a good idea in such a situation. However, you’ll need to be diligent about turning off the airbags when children are in the front seat and turning them on for adult passengers. Driver and passengers should always be sure to sit at least ten inches away from the airbags. It’s not a good idea for passengers to put their feet up on the dash or lean too close to the airbag. While short stature drivers may be inclined to sit close to the wheel, it is much safer to sit farther away; pedal extenders or other modifications may help to make this positioning more comfortable for short stature adults. While you were probably taught the “10 and 2″ hand position, this is no longer the best alternative in the days of near-universal airbags. 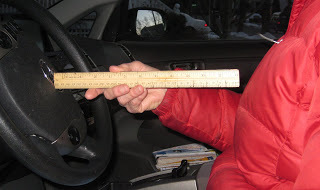 If your hands are too close to the top of the wheel when the airbags deploy, you’ll end up punching yourself in the face.Instead, driving instructors, including those who teach drivers of emergency vehicles, recommend placing hands between “8 and 4″ and “9 and 3.” In addition to being safer, this is also a more natural position that causes less stress to the arms. 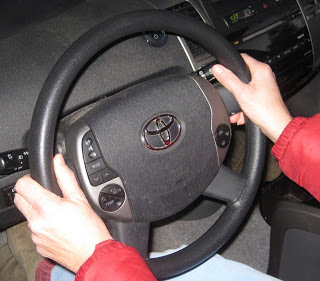 Instructors also recommend using modified hand-to-hand steering when turning. Instead of bringing your hands together at the top of the wheel, push up with one hand; then, before that hand reaches the top of the wheel, slide the other hand up and pull down. You will be feed the wheel through your hands without actually bringing either hand to the top of the wheel. Today, many car manufacturers are developing smart air bag technology that is making airbags safer to use. Since 2006, all car manufacturers have been required to implement sensors that can detect when a child or improperly positioned adult is in the front seat and modify (or stop) the deployment of airbags. “Smart” airbags are also designed to deploy in two stages: a smaller deployment for minor fender benders and a full deployment for more serious accidents. In addition to being safer, these designs can also save money, as most airbags need to be replaced after deployment. Even if you have smart airbags in your car, however, you should still seat children in the back seat. To read more on a broad range of subjects from “How To Change A Tire” to “How To Jumpstart Your Car”, visit DefensiveDriving.com’s Safe Driver Resources website!